Novelist & Historian of London Gillian Tindall takes over as guest author this week in celebration of the publication of her new book, A Tunnel Through Time, A New Route for an Old London Journey by Chatto & Windus. You owe me five farthings, say the bells of St Martins. When will you pay me? say the bells of Old Bailey. May I suggest that if Whitechapel could only suggest sticks and an apple, it was not a very salubrious neighbourhood even then? From Aldgate, the eastern gate of the City, Whitechapel High St runs for a mile to the point where Mile End Rd starts and was long known as ‘the back door to London.’ In the fifteenth century, when a group of young noblemen on a night out in Whitechapel got into an argument with local lads which became a mass brawl, three commoners ended up dead. At that time, gentlemen usually carried daggers and no nobleman got punished. 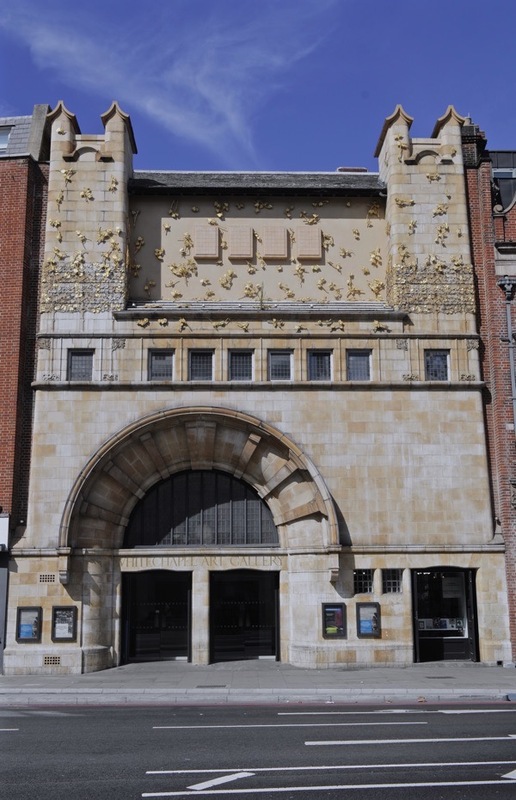 A century later, in the Elizabethan era, there were taverns all along Whitechapel High St and in Aldgate stood the Red Lion playhouse where Shakespeare appeared early in his career. 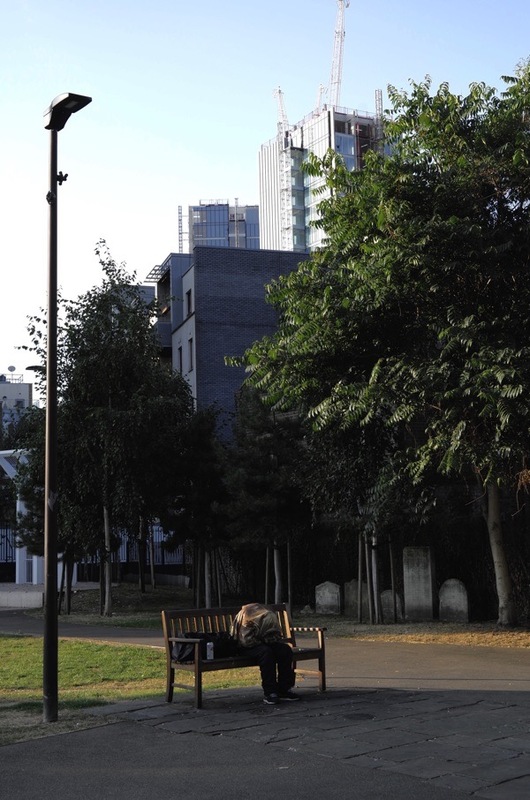 The London commentator, John Stow, complained that the street was ‘pestered with cottages and alleys’ and the fields where he had played as a child were being built over. Three hundred years more and these dense, squalid side streets became notorious as locations of the Whitechapel Murders. In the mid-twentieth century, Whitechapel acquired new notoriety in the form of the nefarious activities of the Kray twins at The Blind Beggar, even though neither of these sensation narratives, endlessly milked today for tourists, have much to do with the reality of life in the East End. 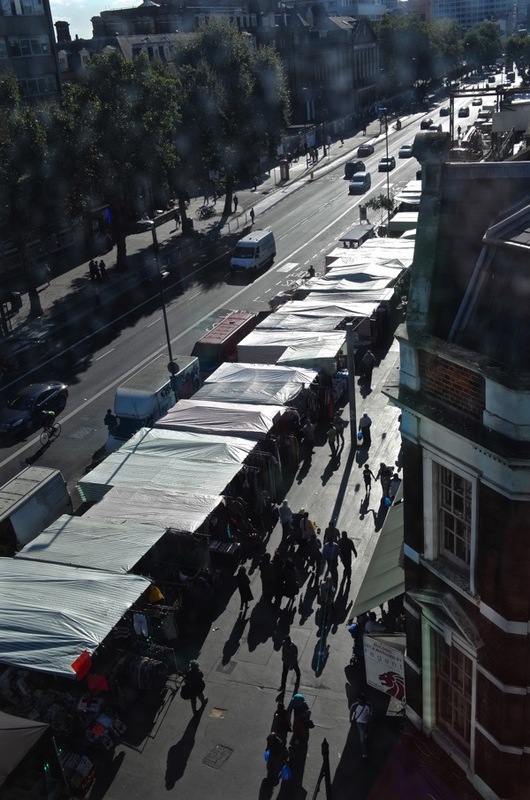 Whitechapel has a history of mixed fortunes. Its location near both the City and the Docks, ensured that, thanks to expanding trade, many people were making a good living there in the eighteenth century. 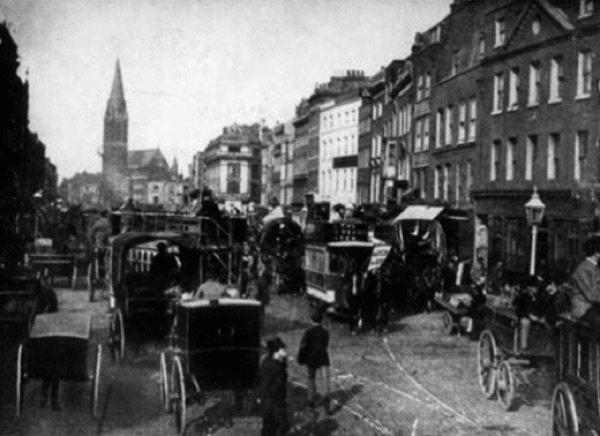 In the Georgian era, sugar refiners, rope and sail-makers, timber merchants, gun-makers, bell-founders and skilled engineers lived and worked in Whitechapel, and they were well-to-do people. Among them were Fellows of the Royal Society and authors of books on navigation for the expanding world. Captain Cook and his family had a house just beyond Mile End in the seventy-seventies, disgracefully demolished by the local authority in 1958. Where, you may ask, did these respectable folk attend church, as they surely must have done? 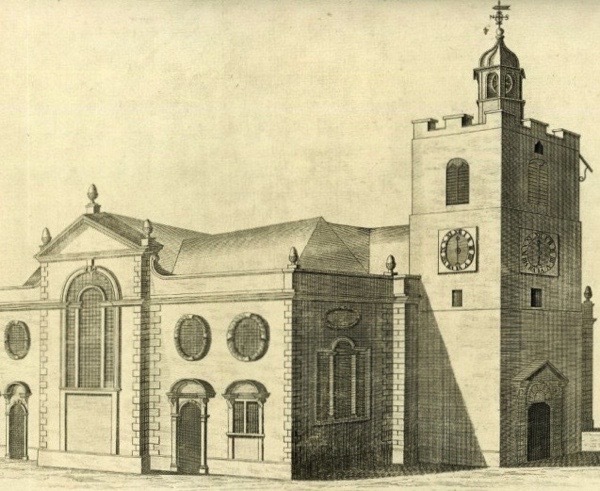 For centuries, the church for the huge parish of the’Tower Hamlets,’ when it contained little more than small farming settlements and a few isolated grand houses, was St Dunstan’s at Stepney. 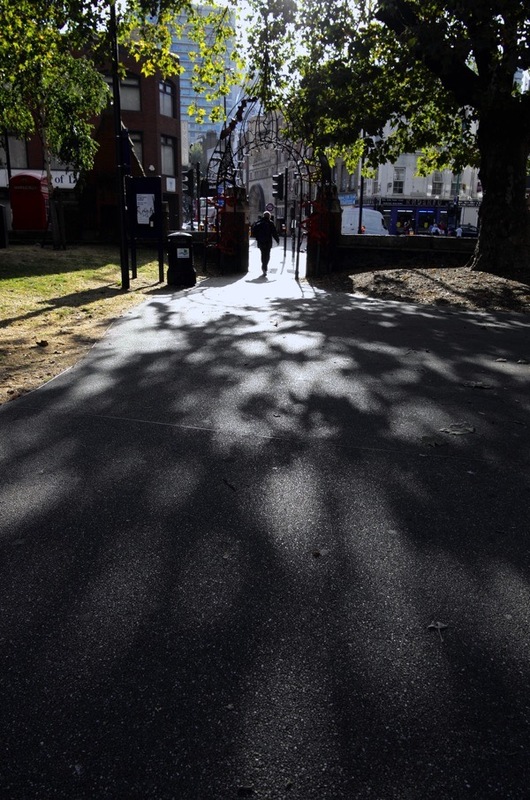 Yet already, in the Middle Ages, there were a significant number of people living just outside the City gate who did not want to trek through the mud to Stepney in winter. It was to accommodate them that a small chapel of ease was built of stone-rubble near Aldgate in the thirteenth century, rebuilt a hundred years later, given a coat of white limewash and dedicated to ‘St Mary Matfelon.’ This was the long-enduring White Chapel, which, standing out from afar, was to give its unofficial description to the place. 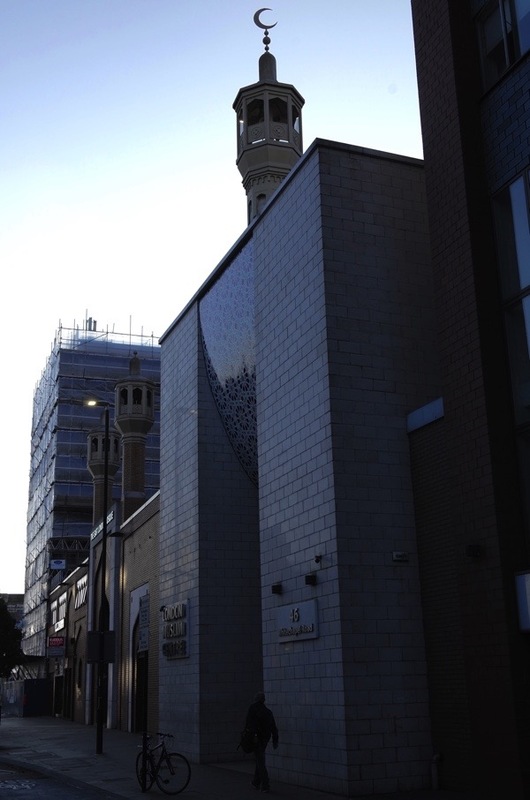 By the late seventeenth century, with Charles II on the throne and the old City recently burnt out in the Great Fire, it was obvious that the population of the Tower Hamlets was growing fast and one church was not enough. The parish of St Dunstan’s was divided into nine, with new churches built and St Mary’s rebuilt again, in red brick this time, to provide space for the by-now very substantial population of Whitechapel. The land round the chapel, which had unofficially received hundreds of bodies already – including probably that of Charles I’s executioner, Richard Brandon – now became a prestigious local graveyard. Sir John Cass, founder of the Stepney school that still bears his name was buried there, and so were members of the Cooke family, a distinguished clan with governmental connections and a coat of arms. 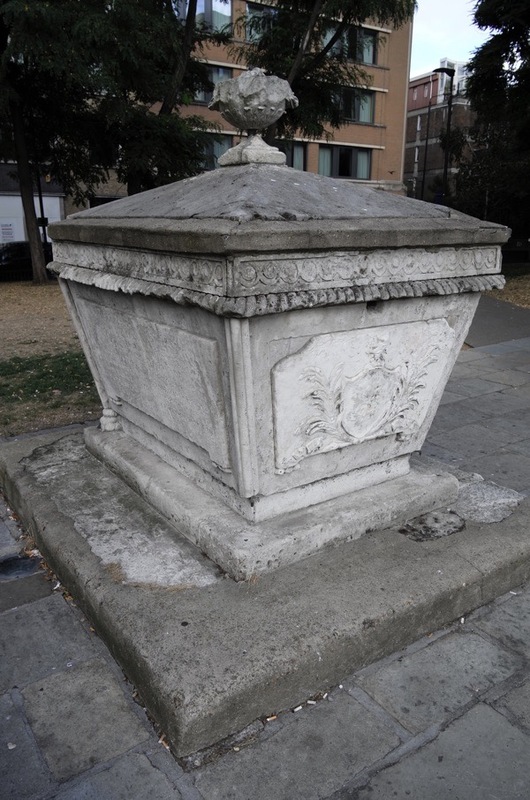 The Maddocks, another armigerous local family who were prosperous timber merchants just off Cable St, also paid for an elegant tomb of their own. Into it, between 1774 and 1810, went Nathan Maddock and his wife Elizabeth, both only in middle life, a daughter of thirteen, a sister-in-law of twenty-five, and her son when he was seventeen. 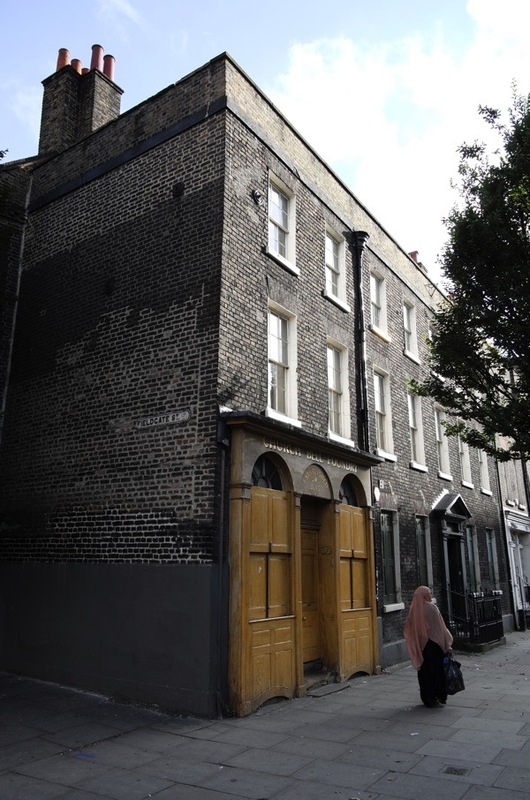 It is a relief to find that Richard Maddock (who did not actually live in Whitechapel any longer but grandly in St James) was seventy when he died, and his sister seventy-nine. A James Maddock died aged nineteen, but that same year another James in the same family was negotiating the deeds of land in the area on which he intended to build and he appears to have lived so long that the tomb was full before it could accommodate him. How do I know all this? Because the tomb, complete with a worn crest of stone feathers and a ‘demi lion rampant,’ is to be found on the site of the old churchyard to this day. It is one of only two sarcophagus tombs that have survived the clearances which took place when the ground was shut for burials in the eighteen-fifties, when the church was rebuilt for the third time in 1877, redone again after a fire in 1880, and when bombs destroyed it in 1940. With its button-lidded top, the tomb looks exactly like an enormous soup-tureen for a family of giants with a rather pretentious taste in crockery. 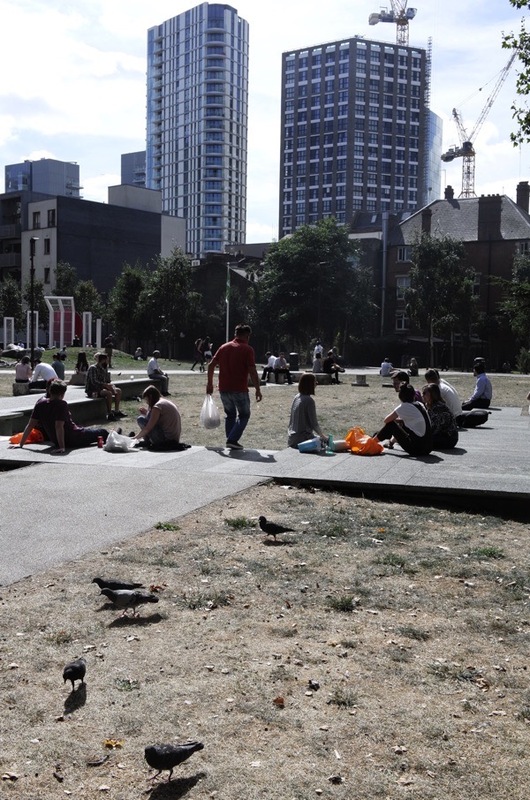 On seats nearby, on a grassy bank that conceals a mountain of blitz rubble, and vestigial stone walls marking the outlines of two by-gone churches, City workers eat takeaway lunches, young men smoke and look bored, while heavily-shrouded young women confer over pushchairs. Whether they admire the tomb, realise what it is or simply ignore it, I cannot say. 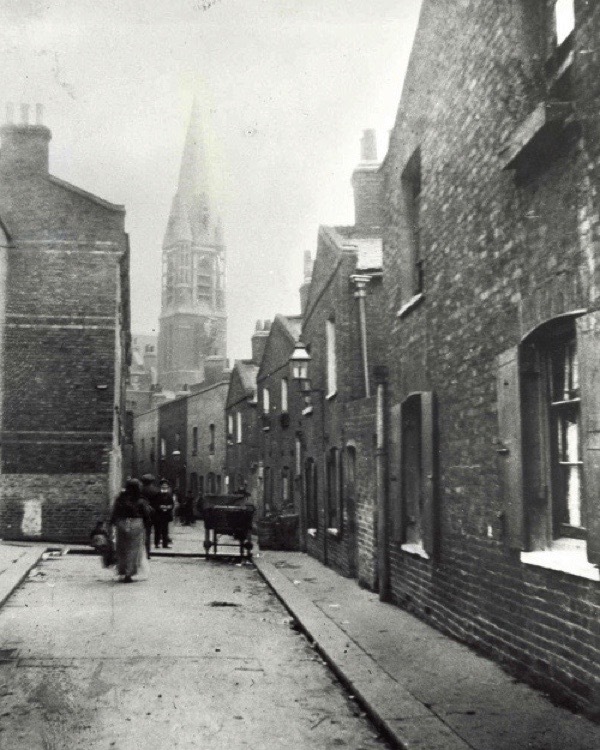 St Mary Matfelon, the White Chapel, seen from Green Dragon Yard in the nineteenth century. Can you give any explanation I wonder, for the monument on the remaining perimeter wall from the late 1800 with the words “Placed here by one unknown, but known to many” or words to that effect? It is aging and wearing badly now but was still there when I last visited in July 2016 and I recall it having been there as a boy in the 1970′s so I assume it has been there, in that same place since being erected. Interesting read. Never knew that the white chapel became a Victorian church and was quite recently lost in the blitz. I’ve truly enjoyed your posts this week and learned so much! Thank you and good luck with your new book. I’m thoroughly enjoying Gillian’s posts this week. Many thanks. I too enjoy reading these posts by Gillian, I like the straightforward and informative way of writing. Thank you. One comment today. When did such congestion as can be seen in one of these photos, become a problem, and did people complain about it as we like to do now. There are constant complaints about holdups to the traffic where I live, but it is nothing compared to this!! Really enjoyed these reads this week. Wanted to come along next week but will be away on holiday. Please let us know if there are any more planned. 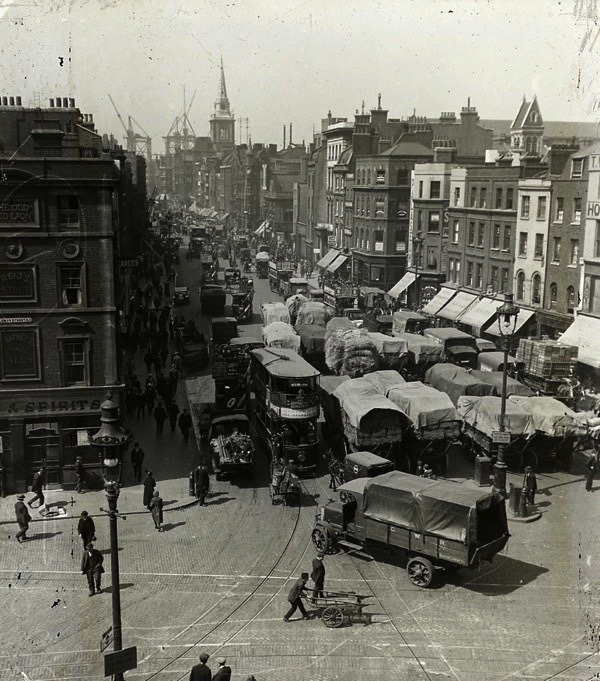 This is an enormously fascinating and well-written description of the history of Whitechapel. I only saw this by accident on Twitter but couldn’t stop reading. The pictures are real gems. Simon. That monument used to be inside the church, apparently. Odd, as it was clearly a drinking fountain at some point. “By one unknown, yet known to many”. Very cryptic. When one used to look through the hole in the centre of the “Face” it perfectly framed the last surviving sepulchre in the park. The council then placed a dog-waste bin right in the way, ruining that effect!